Paleoanthropology, zooarchaeology, taphonomy, faunal analysis, Paleolithic archaeology, evolution of human diet, evolution education and outreach. Regional focus: Africa. To see Dr. Pobiner's complete CV, click here. Dr. Pobiner’s research centers on the evolution of human diet (with a focus on meat-eating), but has included topics as diverse as chimpanzee carnivory and cannibalism in the Cook islands. 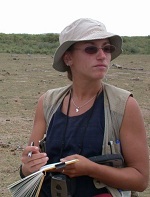 She has done fieldwork in modern ecosystems and fossil excavations in Kenya, Tanzania, South Africa, and Indonesia. 2012 Pobiner, B.L. "Use human examples to teach evolution," American Biology Teacher 74(2): 71-72. 2011 Indriati, E., C.C. Swisher, C. Lepre, R.L. Quinn, R.A. Suriyanto, A.T. Hascaryo, R. Grún, C.S. Feibel, B.L. Pobiner, S.C. Antón. "Reassessing the age of the 20 meter Solo River Terrace, Central Java, Indonesia, and the survival of Late Homo erectus in Asia," PLOS One 6(6), June 26. doi: 10.1371/journal.pone.0021562. 2008 Pobiner, B.L. "Paleoecological information in predator tooth marks," Journal of Taphonomy 63(3-4): 373-397. 2008 Braun, D.R., Pobiner, B.L., Thompson, J.C. "An experimental investigation of cut mark production and stone tool attrition," Journal of Archaeological Science 35: 1216-1223. 2007 Pobiner, B.L., J. DeSilva, W.J. Sanders, J.C. Mitani. "Taphonomic analysis of skeletal remains from chimpanzee hunts at Ngogo, Kibale National Park, Uganda," Journal of Human Evolution 52(6): 614-636. 2006 Blumenschine, R.J., B.L. Pobiner. "Zooarchaeology and the ecology of Oldowan hominin carnivory." In P. Ungar, ed., Evolution of the Human Diet: The Known, the Unknown and the Unknowable. Oxford: Oxford University Press, pp. 167-190. 2005 Pobiner, B.L., D.R. Braun. "Strengthening the inferential link between cutmark frequency data and Oldowan hominid behavior: Results from modern butchery experiments," Journal of Taphonomy 3: 107-119. 2003 Pobiner, B.L., R.J. Blumenschine. "A taphonomic perspective on the Oldowan hominid encroachment on the carnivoran paleoguild," Journal of Taphonomy 1(2): 115-141.